Sasha Bakaric, of Chapel Hill, was one of the featured artists last month at Frank gallery in Chapel Hill. Bakaric uses microscopic images of various cells and microorganisms as her inspiration for creating her ceramics. Pamela Gutlon, owner of Outsiders Art & Collectibles, a gallery in Durham that focuses on Southern self-taught art, announced the two-year anniversary of the company. Jan-Ru Wan, Chapel Hill textile artist and assistant professor at N.C. State University of Art and Design, in Raleigh, was selected by Chapel Hill's Public and Cultural Arts office to lead participants at the Seymour Senior Center in creating a collective art installation with re-purposed clothes and other objects. Wan will conduct a series of workshops from January through March, and the art installation will be permanently displayed at the center. Amanda Hughes, director of external affairs at Ackland Art Museum, in Chapel Hill, presents "Drawing in the Galleries," this month. Participants have the opportunity to practice and strengthen their drawing skills. Emily Page, owner of Artistic Abandon, in Raleigh, announced that it is hosting a fundraiser to benefit Hospice of Wake County, as part of its Heart-full Art series, this month. 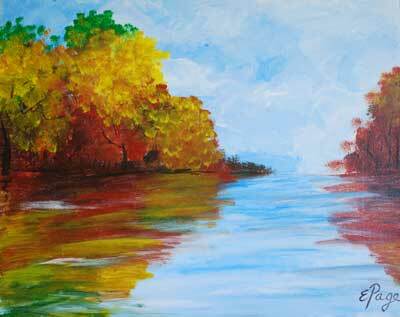 Participants will paint the Artistic Abandon painting "Autumn Pond" for the event. Santrell Caison, director of admissions at Wake Tech, in Raleigh, received the Fulbright International Education Administrator award. Anna Burrelli has joined the admissions department of William Peace University, in Raleigh, as an admissions counselor. Jo Allen, Ph.D., president of Meredith College, in Raleigh, announced that the college will add lacrosse as its seventh varsity sport. Jennifer Dunleavy, president of Accuro, a Raleigh-based staffing and recruitment company, announced the addition of Dendy Askins as client services associate. Barbara Anne Eagles, veteran home builder, joined Reward Builders, in Cary, as project manager. The firm was recognized by the National Association of Students Against Violence Everywhere (SAVE) with the Gary N. Brown Outstanding Volunteer Award. The award is given each year to an organization that provides service to and support of SAVE's vision, mission and goals. Kate Catlin, senior account manager, participated in "The Great Talent Search," a Greater Raleigh Chamber of Commerce panel discussion, last month. Susanne Gaddis, Ph.D., CEO of the Communications Doctor, of Chapel Hill, announced she was selected to be featured in the 2012 Woman's Advantage Shared Wisdom Calendar. The calendar provides advice from female leaders for women business owners. Ashley Matlock Perkinson, an attorney and principal of Perkinson Law Firm, in Raleigh, was elected to the board of trustees of the N.C. Symphony Society. Catherine Melonas joined haircolorxperts at the Arboretum, in Cary, as a senior specialist. Dina Mills and her husband, Jonathan, owners of LunaPops, in Chapel Hill, announced that it was awarded "Best New Food Product of 2011" at Expo East, the biggest natural foods trade show east of the Rocky Mountains. Kathy Murchison, CEO of DocuSource, in Research Triangle Park, announced that it is celebrating its 10-year anniversary as a Triangle enterprise. Laura Schoppe, president of Fuentek, in Apex, lead a briefing at the Technology Transfer Integrated Planning Team Workshop, presented by the U.S. Department of Defense, last month. Samantha Bunn, shop manager, who was named Wake County Designer of the Year 2011. Venetia Gentzier, floral designer, who was second runner-up in the competition. Leah Schaubach was hired as a business-development associate at Everest Agency, a website design firm, in Raleigh. Shekar Challa, CEO of Challa Law Offices, announced its new location in Morrisville. Better Business Bureau, in Raleigh, named Andrea Liverman to the newly created role of vice president and chief operations officer. Valerie Zefiretto joined RN Rouse, a commercial construction services company, in Raleigh, as a marketing specialist. Kc Coolbaugh, a Minding Your Matters senior organizing consultant, was named "Volunteer of the Year" by the Institute for Challenging Disorganization. Patricia Harris, Persian Gulf combat veteran from Raleigh, was the parade chair for the N.C. State Veteran's Day parade, last month. Gov. Bev Perdue launched the Career & College promise, last month. The promise will prepare students for life after high school. Natalie Perkins, president of Clean Design, an agency in Raleigh, was appointed to a second consecutive term on the board of directors of the Greater Raleigh Chamber of Commerce. Charissa McFarland, of the Chi Rho Omega chapter of Alpha Kappa Alpha sorority, announced that it accepted a $4,000 donation from The Family Resource Center of Raleigh. The donation will support the chapter's Emerging Youth Leaders program and the establishment of a program for teenage girls. Garla Smith, owner and president of Smart Moms, in Cary, was selected Career Woman of the Year by the Raleigh Federation of Business and Professional Women. Rosemarie Allen Ryan, president and CEO of Prevent Child Abuse North Carolina, in Raleigh, announced that it received a grant from the Kate B. Reynolds Charitable Trust to work with community-based agencies to address substance-abuse problems and behavioral-health issues in youth. Kaye Williams Crawford, a Hillsborough native, received the 2011 Helping Hand Award from the Hillsborough/Orange County Chamber of Commerce. Rachel Klem, owner of Common Ground Theatre, in Durham, teamed up with local filmmaker Jeffery Moore to present "A Trailer Park Christmas." Common Ground Theatre offers the show throughout December. Terry Rhodes, director of the UNC Opera, will direct "UNC Opera: Music of Jacques Offenbach," this month. Rachel Gragg, director of public relations at Durham Performing Arts Center, announced that DPAC celebrated its third anniversary and welcomed its one millionth guest, in November. Holly Owens, along with Chris Owens, of Triangle Swing Dance Society, teaches a dance class this month at Murphey School, in Durham. Jane Hawkins, pianist, professor of the practice of music and chair of the Department of Music at Duke University, plays this month in the faculty recital entitled "1850-1950: The Viola Emerges. Music from Schumann to Stravinsky." Lydia Kaus, LPC, LCAS, who was added as a counselor, will provide individual and group therapy. Margaret Donald was added as an intern, and will assist with case management. Lisa Feierstein, RN BSN, MBA, co-founder and president of Active Healthcare, in Raleigh, was the event chair for Speaking of Women's Health. Feierstein spoke on the importance of sleep for a healthy life. Cathy Green Burns, president of Food Lion, joined the Duke Children's National Board of Advisors Executive Committee, in Durham. Anne Thornhill, MPH, senior manager of N.C. Prevention Partners, announced that it received the Healthy Innovation Living Award from the Department of Health and Human Services, last month. N.C. Prevention Partners was recognized for its Healthy N.C. Hospitals Initiative: Healthy Food Environment Project, which aims to make healthy food at hospitals the easy, affordable choice. Nancy McFarlane, president of MedPro Rx, in Raleigh, announced that Gina Ceremuga, of Cary, was hired as a clinical pharmacist. Dr. Darcy Ward and Dr. Jennifer Greenfield, doctors of chiropractic at Center for Chiropractic & Wellness, in North Raleigh, announced the Vitamin Challenge promotion. The ongoing event is designed to promote whole-food dietary supplements. Beth Rudisil, director of WakeMed Rehab Hospital, in Raleigh, announced that the hospital's rehab programs have been reaccredited for three years by CARF International, a human-services accreditation agency. Alana Stevenson, a professional dog and cat behaviorist, dog trainer, certified animal message therapist and author of "Training Your Dog the Humane Way: Simple Teaching Tips for Resolving Problem Behaviors and Raising a Happy Dog," is now offering her services in Raleigh. Suzy Barile, writer and english/journalism instructor at Wake Tech Community College, in Raleigh, announced that her book "Undaunted Heart: The True Story of a Southern Belle & a Yankee General," is in its second printing. Nancy Peacock, a writer from Chatham County, taught the prompt writing class, last month, at Flyleaf Books, in Chapel Hill. Her writing workshops run every second Saturday at Flyleaf.